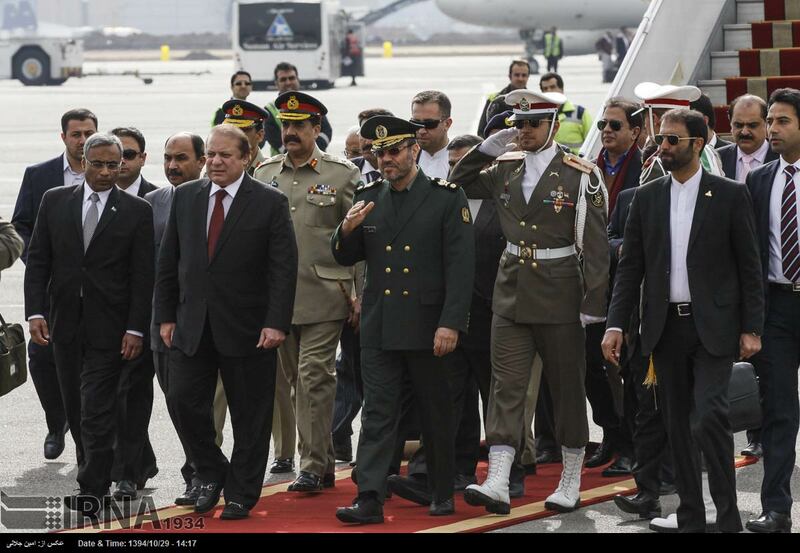 Pakistan's Prime Minister Nawaz Sharif has arrived in Tehran to hold talks with senior Iranian officials. Sharif, who is heading a high-ranking delegation, was welcomed at Tehran Mehrabad airport by Iranian Defense Minister Brigadier General Hossein Dehqan on Tuesday. Pakistan's Prime Minister Nawaz Sharif (2nd left) was welcomed by Iranian Defense Minister Brigadier General Hossein (center) upon arrival at Tehran Mehrabad airport on Tuesday. During his day-long stay in Tehran, Sharif is scheduled to sit down with Iranian President Hassan Rouhani and First Vice President Es'haq Jahangiri. Sharif is visiting Iran after making an official trip to Saudi Arabia on Monday. In Riyadh, Sharif expressed "deep concern" to Saudi King Salman over escalating tensions between Tehran and Riyadh. "The prime minister expressed our deep concern on the recent escalation of tensions" between Iran and Saudi Arabia following the January 2 execution of prominent cleric Sheikh Nimr al-Nimr in Riyadh, Pakistan's foreign ministry spokesman Qazi Khalilullah said. "He also called for an early resolution of differences through peaceful means, in the larger interest of [Islamic] Ummah, particularly during these challenging times," Khalilullah added. Nimr's execution was widely censured by Muslims and human rights activists around the globe as well as different governments. Saudi Arabia severed diplomatic relations with Iran on January 3 following demonstrations outside the Saudi embassy in Tehran and its consulate in the northeastern city of Mashhad by angry protesters. The Saudi diplomatic premises was attacked by some during the demonstrations. Iranian officials strongly denounced the raids and have arrested over 150 people over the incident. Besides Pakistan, other countries, including Russia and China, have voiced readiness to mediate between Iran and Saudi Arabia.